THE AQUATROL LOW SALT ELECTRONIC CHLORINE GENERATOR from Hayward is a must for any Above Ground Pool Owner considering using salt water in their pool. Less chance for pool equipment corrosion! Hayward's new low salt AquaTrol offers the same luxuriously soft water and hassle-free sanitization that salt chlorine users expect, but now using much lower salt concentrations. 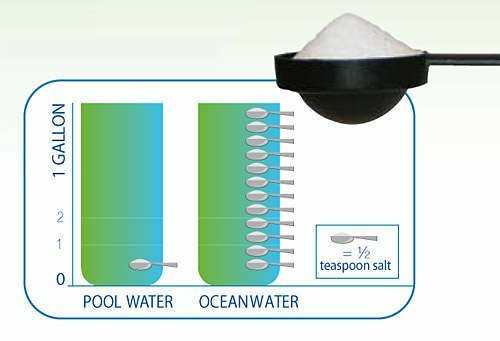 A lower salt level in the pool is more environmentally friendly, eases concern over pool equipment corrosion and reduces the amount of salt necessary to purchase. It’s possible with the AquaTrol Low Salt Electronic Chlorine Generator. AquaTrol Low Salt delivers 100% of the sanitization your water needs through common salt, not factory-created chlorine. Just natural, refreshing water you can swim in without limitation. AquaTrol Low Salt uses advanced electrolytic technology to convert a small amount of ordinary salt – one teaspoon per gallon of pool water – into a virtually endless supply of fresh, pure chlorine. The process can produce enough chlorine a day to satisfy the sanitization requirements of pools up to 18,000 gallons. And since the salt doesn’t wear out or evaporate, you rarely have to add more. There are two components to AquaTrol Low Salt: the control box and its patented TurboCell®, a specially designed electrolytic converter that installs on your system’s return line, behind the pump, filter and heater. The AquaTrol Low Salt Chlorine Generator from Hayward offers the same simple, safe and affordable approach to pool sanitization that you would expect from the original Aqua Rite, but uses virtually half the amount of salt, making it an even more environmentally friendly approach to salt chlorine generation. They easily install on standard filtration systems, both for new construction and on existing pools. Salt (NaCl) is present in tap water and in pools treated with stabilized liquid or chlorine pucks. Over time, conventionally treated pools will have an elevated residual of salt as a by-product of sanitizing. The AquaTrol Low Salt chlorinator has the ability to stop producing chlorine at 800 p.p.m. and operates at just 1200 - 1800 p.p.m. (this is roughly half the amount of the standard Aqua Rite.) The benefits of lower salt levels include a reduction/elimination of electrolytic corrosion, a reduced environmental impact as well as reduced operation costs with less salt addition. Installing the AquaTrol Low Salt does not change from a typical installation, however it is a good idea to ensure the water is tested for salt prior to adding salt. In many cases when installed on an existing pool previously sanitized by liquid or pucks - NO salt will be needed. AquaTrol Low Salt uses advanced electrolytic technology to convert a small amount of ordinary salt – one teaspoon per gallon of pool water – into a virtually endless supply of fresh, pure chlorine. The process can produce enough chlorine a day to satisfy the sanitization requirements of most pools. And since the salt doesn’t wear out or evaporate, you rarely have to add more.